Even taking it as standard that Notts would have the usual managerial change at the start of the season, this was not a particularly quiet August. 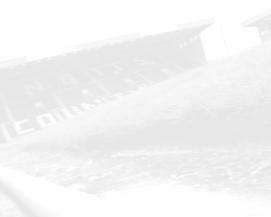 The new kit was launched in the full glare of publicity during pre-season. Precision Training were the company behind it, Medoc the firm on the front as sponsors. The predominance of white voted for in the previous year was cast aside and a return to black instigated with gold as piping. The away kit was gold with black. As with two years previously, very few of the old squad survived to sport the new look and Steve Thompson (himself a new arrival) was able to begin with a relatively clean slate. 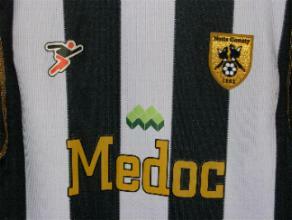 Local computer company Medoc were installed as sponsors by the end of the 2005-6 season allowing the new kit to be unveiled before the last match against Bury. Chosen by a panel of Supporters Club,Trust members and club officials, the main difference was a return to the more traditional black predominance. 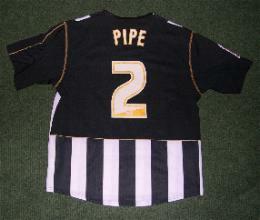 The player's kit as it should be. 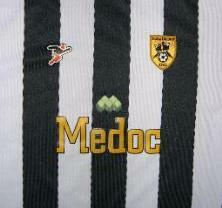 The black stripe runs down the middle of the sponsors logo. All replicas, after the first batch, also looked like this. The incorrectly printed replicas look like this, with a white stripe down the middle. 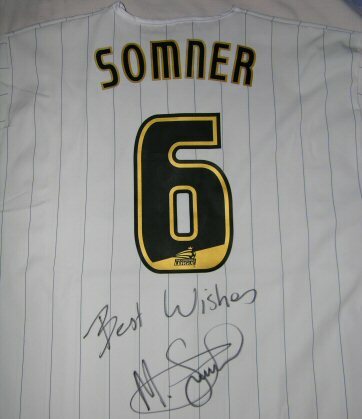 Whilst awaiting supplies of the first team kit replacement replicas, the new away strip appeared by way of compensation. 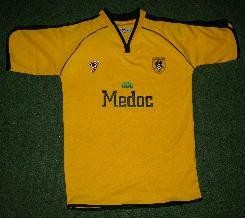 The shirt was a rather nice gold - reintroducing the clubs third colour. It's premature arrival may have been a bit of a shock to the guy who bought the prototype off Ebay just before for a three figure sum. His hopes of parading around in it for a while as an exclusive item were dashed as the design became the only replica available for the opening few weeks of the season ! The differences between the player issue and the replicas for this season is minimal. On the away, there is no way of knowing unless you go by the Coca-Cola epaulettes (which were on sale seperately though).With the homes, the first batch of squad shirts has a different label to their later replicas. 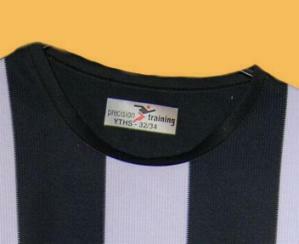 The latter contain a 'Precision Training' tag, the former, merely the size. 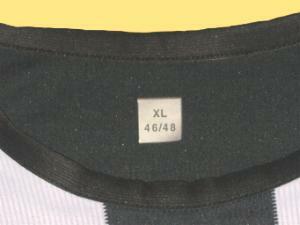 As shirts were replaced though, the later player issue also had the same tag as the replica and so that ceases to become a reliable distinction. In one of those little anomalies that always seem to hit Notts, a kit clash with Boston caused, for the third season running, the need to provide a third choice kit for a single fixture. 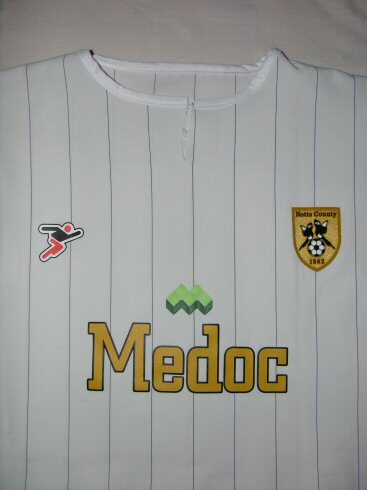 Naturally this would not be a shirt that was marketed commercially and also naturally therefore, it would be a far nicer one than the two that were.It was all white (traditionally a popular choice amongst fans) but with very thin stripes and made by the regular kit manufacturers Precision Training. The one pictured above belonging to Alan White was one of two made for him and most of the players on that day (including subs). 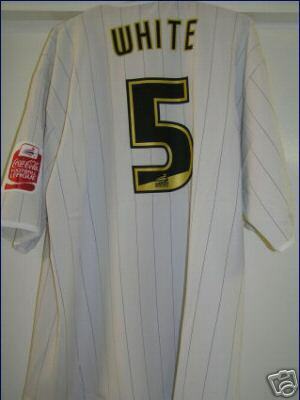 When the club put it on Ebay, the price immediately rocketed to bidders who obviously didn't work out there were at least another fourteen more the club would definately be keen to sell on.When they did come up for sale in the club shop and for auction, they went very quickly indeed ! 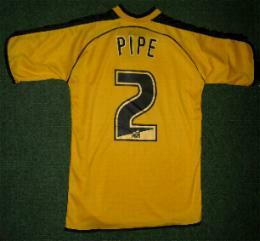 Obviously, only the players that were in the squad that day had a shirt - Pipe, for example, was suspended and so didn't have one.Most of the rest had two each. The only clue to whether you have the one that was worn on the day is where you got it from. 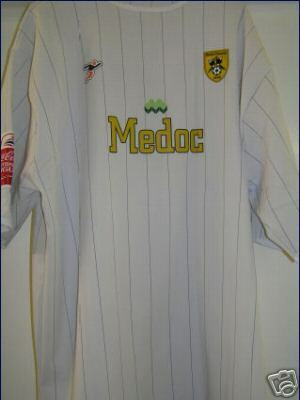 If you bought it on the net, they tended to be the issued but not worn shirts.If you got it from the shop, that was the kit that was worn on the day so keep your price tag on for authenticity ! There were a couple of unused blank shirts (called 'blood shirts' because they were kept in case of a quick change being needed on the pitch). They were also sold. 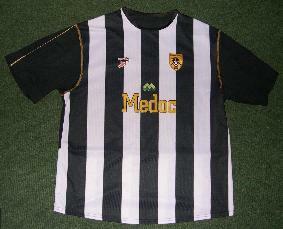 Notts fans always go for white shirts so it was no suprise when they sold out very quickly in the shop. For the players it was different. The material and the tight neck led Somner to declare it was the worst shirt he'd ever worn. Some tore the top (as you can see above) to give themselves more breathing space - a good sign they were worn as most players in the squad had two issued and it can be difficult to tell.